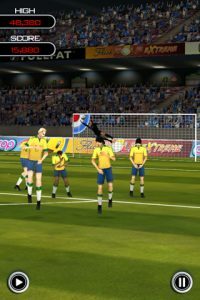 Whether you’re on the bus, between meetings, or just in the mood for a quick play, Flick Soccer from Full Fat Games is just about the perfect game for your iPhone. Combining quick reflexes with skill, the game is easy to learn, but difficult to master. And once you do master the different techniques necessary for success, Flick Soccer has plenty of modes for you to branch out into. Too often, developers try to shoehorn complex gaming experiences better suited for home consoles onto the admittedly powerful iOS platform. But Flick Soccer doesn’t make that mistake. Its arcade sensibility and clever design makes it one of the best bangs for your buck on the App Store. 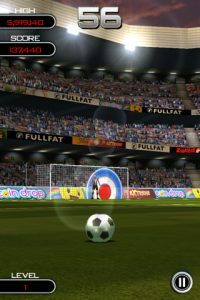 It bears noting that Flick Soccer shares a striking similarity to the already-popular Flick Kick series in that players must launch the ball into the goal, avoiding opposing players and hitting targets or hot-zones, simply by flicking their fingers. 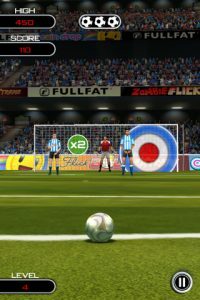 And like Flick Kick, players are able to curve and hook their shots by using different flicking techniques. It’s probably true that if you already own a Flick Kick game and are quite content with it, you probably don’t need to spend the extra dollar to obtain Flick Soccer. However, if you are not a Flick Kick aficionado or maybe want a similar game with some extra twists and modes, Flick Kick is a no-brainer. There are five modes in Flick Soccer. The first is Quickshot, and it’s the most basic of the modes. It’s a race against the clock to see how many goals you can score and how many targets you can hit. Each time you hit a target, the clock gains either one, two, or three seconds, depending on where on the target the ball lands. As you progress, the goalie and opposing team members change their position and the angle of your shot changes as well. In Endourance Mode, you begin with three balls. Scoring a goal is not good enough, as each time you miss the target you lose a ball. In addition, hit the target and the floating ball icon, and you’ll gain a ball. The key to success in Endourance is taking your time and lining up the perfect shot. Do that and you’ll be racking up high scores in no time. Challenge Mode places the target in different corners of the goal and you score points by aiming for the bulls-eye. To pass to the next challenge, you’ll have to learn dead-on precision in order to earn the required points. Crossbar and Smash It modes require you to aim for different objects on or in the goal. As its name implies, in Crossbar you’ll need to hit the crossbar and the icons that slide back and forth along it. In Smash It, the goal is covered in glass panels and the object is to smash each panel of glass before moving on to the next round. Flick Soccer is a lovely-looking game, both crisp and well animated. The game is laid out so players always have a nice view of the goal in front of them. The crowd noise adds to the thrill of the game, especially as multiple goal chains add up. Background music plays during the menus, and gameplay tips (along with ads for other Full Fat games) are given during the brief loading screens. Bottom Line: Flick Soccer is a flawless handheld game, perfect for quick plays. Despite its simplicity, players will come back again and again to best their scores. 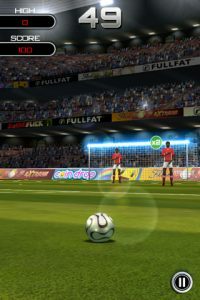 Flick Soccer is compatible with iPhone, iPod touch, and iPad. Requires iOS 3.1 or later.